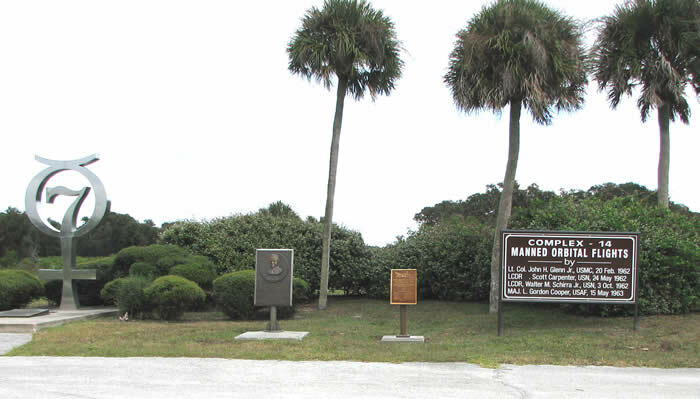 The highlight of our Melbourne reunion was the plaque dedication ceremony held at the Cape Canaveral Air Force Station. 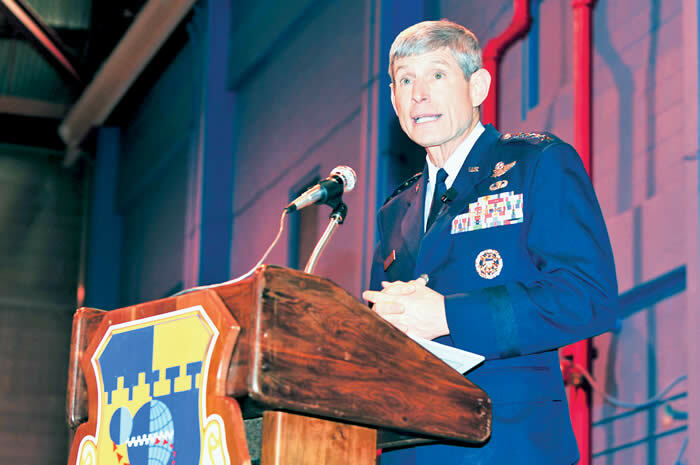 Air Force Chief of Staff General Norton Schwartz was the guest speaker. Printed below is the news release from the 45th Space Wing. Air Force Chief of Staff Gen. Norton Schwartz and Elizabeth Stuart, daughter of Capt. 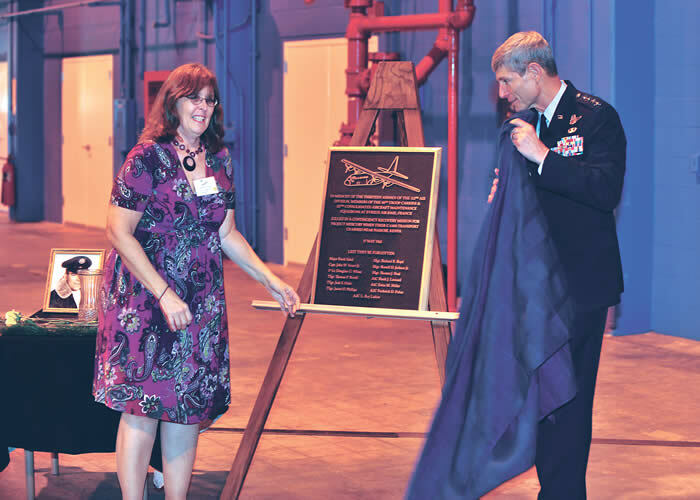 John W. Stuart, Jr., unveil a plaque bearing the names of her father and 12 other Airmen killed in an airplane crash May 17, 1962. while supporting NASA's Mercury mission. General Schwartz traveled to Cape Canaveral Air Force Station, Fla., Oct. 23, 2009, to participate in the ceremony to honor the fallen Airmen. Air Force Chief of Staff Gen. Norton Schwartz provides remarks Oct. 23, 2009, at Cape Canaveral Air Force Station, Fla., during a ceremony honoring 13 Airmen killed in a plane crash May 17, 1962. while supporting NASA's Mercury mission. 10/24/2009 - CAPE CANAVERAL AIR FORCE STATION, Fla. (AFNS) -- It was May 17, 1962, and NASA Astronaut Scott Carpenter was preparing for the Mercury program's second-ever orbital mission. Half way around the world, 13 Airmen were also preparing, getting situated to provide an emergency recovery site in Africa, only one of several such units positioned around the continent and around the globe. 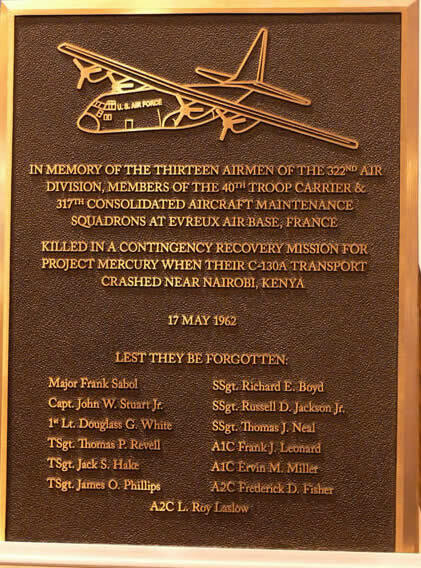 Scott Carpenter eventually landed safely; unfortunately, those 13 Airmen on their contingency recovery mission died when their C-130 Hercules crashed into a mountainside near Nairobi, Kenya. There were no survivors. That crew, members of the 322nd Air Division, 40th Troop Carrier and 317th Consolidated Aircraft Maintenance Squadron, were honored Oct. 23 with a memorial and dedication service held here in Hangar F, and presided over by Air Force Chief of Staff Gen. Norton Schwartz. More than seventy family members and hundreds of returning vets of the unit also were in attendance. "It is my honor to be with you, to remember your husbands, fathers and brothers who made what President Lincoln solemnly called "the last full measure of devotion," General Schwartz said. "With today's dedication, we will ensure that the memory of 13 brave Airmen will endure." Mr. Bill Lloyd, president of the 317th Veterans Group, who has worked tirelessly for years to see this ceremony come to fruition, said he and their entire group were very honored to have the highest ranking member of the Air Force take time to remember their fallen friends and comrades. "It says a lot about the chief of staff if you ask me," Mr. Lloyd said. "It just means so much to the family members here to have him come here. It makes us feel good. And as a former C-130 pilot himself, I think maybe he just wanted to be here." Mr. Lloyd also said the support his group has received from members of the 45th Space Wing all along has been "nothing short of phenomenal." "I want to first thank General (Edward L.) Bolton, (commander, 45th Space Wing) and his command for the professional, helpful and friendly manner in which they embraced both us and this memorial service," he said. "And what's even more telling of this wing, is that they acted this way toward us months before they had any inkling the chief of staff would be attending the event.". Elizabeth Stuart was eight-years-old, when her father, Capt. John W. Stuart, went down on that fateful night 47 years ago. Captain Stuart was the plane's co-pilot. His daughter served as the official spokesperson for the group at the service. She joined the chief of staff on the stage. "I went looking on line for something to say today and discovered the Air Force has made this 'The Year of the Family.' How fitting that so many of our families are getting some sort of closure from this beautiful ceremony," said Ms. Stuart, who has worked as an Air Force civilian the last 24 years at Lackland Air Force Base, Texas. "I remember telling other family members that I was going to bring a king-size sheet instead of a box of Kleenex to the ceremony, but now that I'm here, I feel this is a day to rejoice. It's a little bittersweet, but it's a glorious day," she said. General Schwartz closed by thanking the family and friends of the Airmen once again, and said how proud he was of those serving today. "Today, we honor 13 brave Airman, who ... in distinctive service to their country ... made the ultimate sacrifice," he said. "But we can be comforted in the knowledge that their ideals, their professionalism and their undying devotion are so powerfully eternal that they endure in our brave men and women in uniform today. "Perhaps we can find solace in the notion that they surely would proud of today's service men and women, who in humble and selfless service, are protecting and defending America, and performing exceptional deeds around the world," General Schwartz said. to Mercury Launch Complex 14 at Cape Canaveral.